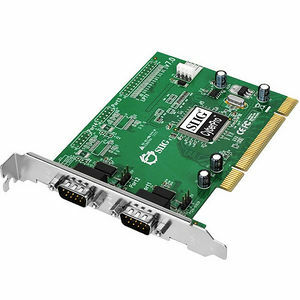 SIIG's CyberSerial Dual PCI is designed to provide you with two additional 9-pin (DB9) serial ports to your desktop computer for more serial-based device connections. This 2-port serial adapter card comes with two high-speed 16550 UART serial ports supporting data transfer rates of up to 230Kb/s. The serial ports can work as either standard RS232 ports, or with 5V/12V power outputs for devices that require power such as handheld scanners, table scanners, and POS displays. Additional features of this CyberSerial Dual adapter card include IRQ sharing to reduce IRQ conflicts, built-in 32-byte FIFO buffers to dramatically increase data transmit/receive speed especially under Windows multitasking environment, and PME (Power Management Event) that allows device to request a change in system power state (wake up system). SIIG's CyberSerial Dual PCI is FCC Class B (DoC) & CE regulatory approved and RoHS-compliant. The CyberSerial Dual PCI is fully compatible with a wide variety of Windows operating systems and is backed by SIIG's limited lifetime warranty.